Taking a breather at my computer here after two days and one night of CMJ which includes six panels, one showcase and one press mixer. After day one's sun, yesterday's northeaster put a damper on the city. I had planned to meet up with other PopMatters writers at the press mixer, but when they bagged out I slogged through the rain anyway. 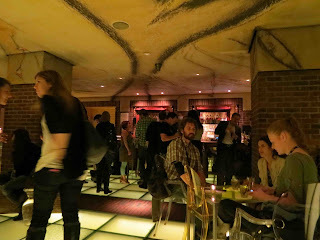 It was held way uptown at the Hudson Hotel (well really more midtown at 58th street, but when everything else is basically below 8th street it felt that way!) There was a fancy party space with the requisite fancy bathroom with faucets that were hard to figure out and music so loud that any conversation that began, ended promptly. Just what music journalists need, more assault to their ears... I walked in to a Maroon 5 song (yes, the one that Darren Criss covered on GLEE) wondering why they could snag a college radio dj to mix it up? I had my free beer -- it was that or spiced rum, no food -- and went back downtown to cover my first showcase at Pianos, happy to already know they have decent bar food there. Write up for the showcase and two more nights of coverage to follow on PopMatters. I'm also planning on writing up the panel experience but they do start to sound the same after a few of them. 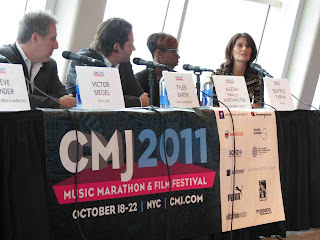 The idea of bands as brands are nothing new but there are new tools to get the word out about the music. Even well-intentioned panelists had to mention if they were once in a band "way back when" (even though it may have been barely five years ago). Plus I stopped by the Ace Hotel to see a staff presentation by KEXP as listed in the comprehensive festival catalogue but it was non-existent. They were all busy broadcasting from the lobby and setting up for the first live act of the day. I did use the opportunity to meet John Richards of "John in the Morning" as I'm a very loyal listener from CT, pic below with links of my coverage on PopMatters. CMJ 2011 Day 3: Alberta Cross + Givers + Portugal. The. Man.